Tulsi Gabbard to Represent US in Astana Peace Talks? Tulsi Gabbard makes unannounced trip to Syria. Russia and Turkey have set up the January 23 Astana talks and has invited the US to participate as the first real shot at ending the Syrian Civil War. Gabbard's office, citing security, says a lot of the details of the trip are not going to be revealed until she has returned to the United States, and they declined to say if she had met directly with President Bashar al-Assad, though they did confirm she'd met with several government leaders while in Damascus. 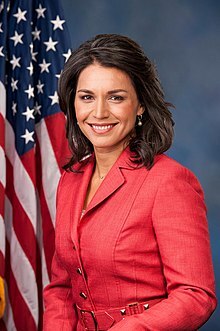 Tulsi Gabbard Democrat from Hawaii, member of the Armed Services Committee, Iraq War Veteran and Major in the Hawaii National Guard is known for speaking truth to power. Gabbard has called for the Obama administration to abandon all assistance to armed groups and stop seeking Assad's overthrow, saying that the effort undermines the fight against the Islamic State there. These views coincide with those of President-elect Donald Trump, who has said the fight against the militants should take priority and has called for cooperation with Russia, Assad's principal foreign backer. Gabbard's trip to Syria was first reported by Foreign Policy. Tulsi Gabbard according to the Washington Post and other sources has made an unannounced trip to Syria and is meetings in Damascus as well. Long opposed to US attempts to impose regime change in Syria, Rep. Tulsi Gabbard (D -- HI) has made a trip to Syria this week, an unannounced visit which saw Gabbard spending considerable time in the capital city of Damascus "to promote and work for peace." With the top jobs in the State Department still vacant in the new administration and the appointment of Rex Tillerson still not confirmed it appears that Tulsi who visited Trump in New York after the election will fill in. They had a "frank and positive conversation in which we discussed a variety of foreign policy issues in depth," she told CNN. She said Trump had requested the meeting to talk about Syria and counter terrorism. With considerable foreign policy similarities between the two, Gabbard has met with President-elect Donald Trump since the election, and was rumored to be under consideration for important cabinet positions. It is entirely possible then that she made the visit as a de facto Trump Administration negotiator. That they specifically declined to say if Rep. Gabbard met with Assad is tantamount to an admission that she did, and indeed it's hard to imagine she would visit Damascus with an eye toward talking peace without meeting with the Syrian president. It's more likely that the denial is intended to prevent any specific official debate around the visit until Friday's inauguration, and that this represents an attempt by the Trump Administration to covertly get out in front of the upcoming Syrian peace talks, which begin Monday in Astana, Kazakhstan. Trump has already been very public in faulting the existing US policy in Syria, and has talked about scrapping efforts to arm the various rebel factions. Gabbard has long criticized the CIA arms smuggling venture, and could easily be laying the groundwork for a quick policy shift in the days to come. In no uncertain terms, she has pointed out fatal flaws in Obama's and Hilary's Syrian plans and US involvement as a repeat of the disaster in Libya 101 and to repeat the massacring of Christians and other minority groups.